Uzor Philip was carrying two bags containing valuables and awaiting a bus going from Oshodi to PWD area of Lagos at about 6pm oblivious of what to happen next. Being the rush hour, the area was crowded as people availed themselves of every opportunity to return home after the day’s business. Suddenly, a pick and drop bus, with number plate EPE 165 XS, approached and stopped. Philip was the first to enter and sit behind the driver but was persuaded to pair with somebody at the front seat. On arriving Ladipo, the bus conductor apologized that the front door was faulty, saying there was need to quickly ‘fix’ the problem. The driver slowed down and the ‘co-passenger’ pushed Uzor out even while the bus was still in motion, leaving his two bags and cell phone (Techno W2) behind. The bus immediately made a u-turn and headed back to Oshodi. That was when it dawned on Philip that he was a victim of ‘one-chance’ and he raised the alarm which attracted some uniformed men who launched a chase after the bus. Inspite of their effort, the bus was far ahead of them and they were almost giving up when they sighted a patrol van of the Lagos State Task Force returning from an operation and they narrated the story of the attack to them. The Task Force team went after the bus and caught up with it around Mile 2. However, one of the suspects took to his heels while the driver and his conductor were apprehended and the bus impounded by the Task Force. 50 cell phones and other valuables were recovered from the bus. On switching on some of the cell phones calls began to come in from their owners and the Task Force requested their physical presence, for identification. Speaking with Sunday Vanguard, one of the victims, whose mobile phone (Alcatel Pop Star 5) had been snatched, Ajimati Adeyemi, 33, said he joined the bus with other passengers along Mile 2 when the conductor and one other person, dressed in ‘black suit’, suddenly stood up and collected all their cell phones and wallets before they were forced down at different bus-stops before Mile 2. He said, “I was surprised when I called my mobile line and I was told to come to Lagos State Task Force at Bolade, Oshodi where it was returned to me along with others.” A female victim, Yewande Adeboye, who claimed to have been seriously injured after she was pushed off by the bus conductor, said she was sexually assaulted and nearly raped before her mobile phone was snatched at Rainbow Bus-stop along Apapa-Oshodi Expressway, Lagos. Another victim, Razaq Rasheed, said he boarded the bus from Anthony to Hassan Bus-stop, also on Oshodi-Apapa Expressway, but ended up being pushed off the bus mid- way into the journey after he had been dispossessed of his phone. 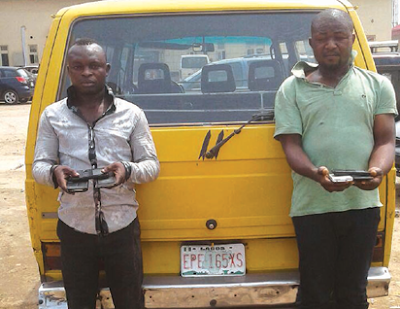 The Chairman of the Task Force, SP Olayinka Egbeyemi, said the operation was carried out after a victim reported that he was robbed inside a commercial (Volkswagen) bus and a Task Force enforcement team with KAI officials were deployed to chase them and they were apprehended around Mile 2 area with 50 different stolen mobile phones. Egbeyemi told Sunday Vanguard the robbers had been charged to court and convicted while the recovered items had been returned to their owners on ‘bond’ after a thorough screening. The Chairman enjoined members of the public to always report illegal and criminal activities around them to law enforcement agencies. In their statements, the convicts, Chuckwudi Ezeudo, of No. 1, Ezeudo Lane, off Babarin Street, Ajegunle, and Mr. Wilfred Ukpo, of No. 1, Ajose Street, Ajegunle, Olodi-Apapa, Lagos, confessed they had been using the bus to rob commuters around Lagos. They confessed they daily operated in different parts of the state like Obalende, Orile, Pen-cinema, Ojota and environs and any passenger who refused to cooperate with them would be beaten and thrown out of the bus while still in motion.